The big Russian biker embraced me with vice like bear hug before kissing me on the cheek; I felt it only appropriate that I returned in kind. Sinus “the Russian king of bikers” and I were saying farewell and I was truly sad. For years I had dreamt of doing what I considered to be the ultimate bike ride, from London to Vladivostok. It would be a ride into the unknown, into the storybook historical lands of Ghengis Khan and Tamerlane. A ride into blazing deserts, soaring mountains and cities bejeweled with magnificent centuries old architecture dotted along the Silk Road. While working in South America as a tour leader I had convinced three other riders to join me on “the last Stans” ride. Within four months of our set departure date we met Cathy McLean, an incredibly brave girl fighting a losing battle with the rare and unusually cruel disease of Freidreichs Ataxia. It was hastily decided to turn the ride into a charity ride and with Cathy, along with us, transforming her support group, Freidreichs Ataxia Network into a registered charity which still exists today as a fundraising and support group for sufferers of the disease. Our itinerary had us sailing out of Newcastle and into Bergen, southern Norway, before riding across Sweden, Finland and into Russia. We then planned to ride the “road of death” in Kazakhstan before joining the Silk Road in Uzbekistan. From Uzbekistan we planned to ride into Kyrgyzstan before briefly entering Kazakhstan and Russia again then riding into Mongolia. From Mongolia we would enter Russia for the last time and ride the legendary Trans Siberian highway before reaching Vladivostok four months after leaving England. The bikes of choice were the Honda Transalp 650 v-twins and were fitted with 35lt fuel tanks, Touratech panniers along with crash bars and aluminium bash plates. Aside from these additions they were stock standard. The first few days were a disaster. Instead of popping champagne bottles and a waving crowd, we left Debenham, England, half a day late. Within a few hours two of the four bikes had broken down, we had become lost, it was cold and we were hungry. Eventually all four bikes broke down. The problem turned out to be that the vacuum pumps supplied to lift the fuel out of the tanks were not up to the job, we kept running out of fuel even though we still had up to 10lts on board. We missed our Bergen ferry by two days. Getting to Vladivostok seemed like a bad joke, let alone our intention. The thrill and overwhelming anticipation of what lay ahead struck us as we eventually sailed into Bergen. We had left very early in the season and snow still lay on the ground as we rode North through the Western Fjords. Voted as one of the worlds most scenic spots, the fjord lands were stunning. The days were spent hugging the dramatic deepwater Fjords that were surrounded by snowcapped peaks and the evenings were spent enjoying a beer at a simple cabin situated at a ridiculously scenic spot. The riding became more difficult as we ventured north. Our progress was being hampered by the constant snow and at times raging blizzards. Hours would be spent in truckstops gulping hot chocolates as we attempted to thaw out. Our original plan had us going to the top of Norway to Nordkapp however the weather had slowed our progress to a crawl. It was decided to drop Nordkapp and ride the Lofoton Islands instead. As we neared the Lofotons the clouds broke and we were greeted by some of the most spectacular scenery any of us had ever seen. The ensuing 30 minute ride was the greatest ride I had ever experienced. Every corner was a scenic overload and every vista literally took our breath away. Tiny red roofed huts stood by the shoreline, racks of Atlantic cod dried in the midnight sun. Storms raged, briefly, above the dramatic towering mountains that stood all around and rainbows formed, dipping into the Atlantic. 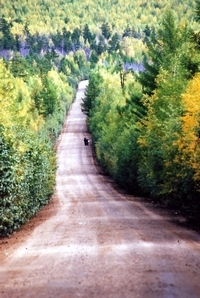 The roads were in excellent condition and there was no traffic, we felt as if we had stumbled onto a biking Shangri-La. The ride took on a new perspective as we entered Russia. We faced new challenges with the language, alphabet and Russian drivers. There is something about riding in Russia that can’t be put into words. It’s a unique, thrilling experience, one that wasn’t possible only a few years ago. We rode onto St Petersburg then onto Moscow. Riding into Red square was one of those magical biking moments as we parked our bikes in the shadows of St Basils. We continued onto Suzdal, an old Russian village seemingly caught in a time warp. The golden Cupolas of the many churches glinted in the afternoon sun while the old crumbling Kremlin stood like a sentinel over the tranquil village. Crossing into Kazakhstan, the roads immediately disappeared to be replaced by an incredibly rough dirt track that stretched off to the horizon. It was what we had come for, to ride the desolate, silent and expansive Kazakh Steppe. Camping out on the steppe in the stunning silence and overwhelming loneliness are moments that will stay with us forever. The bikes were performing well despite our best efforts to wreck them with numerous low speed falls and frame smashing tracks. The reception we received in the Kazakh cities was nothing short of amazing. Locals seemed to be overcome with joy that we had gone to the effort to visit. People lined the footpaths cheering and clapping, the drivers blasted there horns with even the police joining in the celebrations escorting us with sirens wailing and lights flashing, it truly was incredible. We entered Uzbekistan and rode into Tashkent. No road is so evocative or as historical as the Silk Road and we rode a lot of it while we crossed the blazing deserts to reach the Silk Road oasis cities of Samarkand and Bukhara. Spending days in these cities was like stepping back into history as we explored the Souks and Medressas and watched as the setting sun drew another day to a close over the Silk Road. Within one day we had left the heat of the deserts and climbed 3500mt into the cool magnificent mountains that make up Kyrgyzstan. The riding was brilliant as we rode amongst the Central Tien Shan Mountains toward Song Kol. Song Kol is a beautiful lake virtually engulfed by the pristine wilderness, riding across the open grasslands of the yawning valleys toward some Yurts, situated lakeside, was the ultimate expression of biking freedom. The Yurt dwelling families greeted us with a mixture of dismay and curiosity. Their welcome was genuine and humbling, however, as they insisted we join them for some food and salted mare’s milk. After a brief taste of how they lived, we rode onto Kyrgyzstan’s capital, Bishkek where we serviced the bikes and fitted a new set of Metzler Sahara tyres for the dirt and sand of Mongolia. The Continental TKC-80s had done 8000 miles and still had a few more to go but we felt it necessary to change onto the dirt tyres. Our days were spent riding and exploring the wonderful alpine valleys that tumbled out of the Central Tien Shan Mountains that border China. Leaving Kyrgyzstan we again rode into Kazakhstan before continuing onto Russia. No ride across Russia would be complete without a visit to Siberia’s jewel in its crown, Lake Baikal. The world’s deepest freshwater lake is magnificent, surrounded by pine forests, 100ft tall cliffs and beautiful islands. The experience was made all that much better as we were shown around, for three days, by some of the boys from the Irkutsk Motorbike Club. One such member was Timur. Timur lead us out to the lake on his home made bike. With a 1950 BMW motor fitted inside a Ural frame, a rear wheel off a Lada and a hand painted fuel tank, the bike was Timurs pride and joy. Of course things like bike registration, indicators and brake lights were considered a silly extravagance. We rode onto Mongolia and into a land of indescribable beauty, unbroken vistas and utter silence. The riding quickly became the most difficult we had encountered, yet we reveled in it. Navigation proved impossible even with our GPS units as we rode across the vast empty landscape. Scrambling up unmarked passes, falling into freezing rivers and tip toeing across ancient lava fields became daily events and we loved it, hoping that it would never end. End it did though as we yet again crossed into Russia and entered the endless Russian forests of the Taiga. The Trans Siberian Highway was declared open by Vladimir Putin some years ago yet it is anything but. 1100 miles of dirt and mud awaited us. The days were spent riding the world’s longest highway through the endless Taiga forests of Eastern Siberia. The forest itself was turning the colours of autumn and we rode through a kaleidoscope of colours as far as the eye could see, it was spectacular. 15,500 miles after leaving England we rode elated in Vladivostok. It was a moment I had dreamt about for years and it was a moment that didn’t disappoint, the knot in my stomach tightened and a lump in my throat rose. “We did it” I thought, “We did it”. I struggled to keep focus on the Vladivostok traffic; my vision had suddenly become misty. With one final kiss I waved Sinus goodbye, “you good man Mick” he bellowed, but I couldn’t agree, for Sinus epitomized all the incredible people we had met along the ride, the very people that will stay in our memories forever, the people that made the ride what it was, “amazing”. The four Transalps did an incredible job, we suffered two cracked radiators, one leaking rear shock and a seized carburetor (only after the carby ingested so much dust through a cracked air box drain line that it wouldn’t run). Not a single drop of oil was used in 62,000 miles, combined, that the four bikes had covered, not bad for four hopelessly overloaded 650s. In the end we raised $20,000 for Freidreichs Ataxia Network. The fundraising struggle continues to this day as does Cathy’s struggle to hang on. Our main concern during the ride was that the moment we reached Vladivostok the interest and therefore, fundraising, would stop, to an extent this has happened. This ride and the desire to continue the fight against Freidreichs has been the catalyst to the formation of Compass Expeditions a motorcyle expedition company offering the London to Vladivostok ride as well as an extensive list of expeditions covering South America. Part proceeds of each and every expedition goes to our charity, the charity we, along with Cathy McLean, established, Freidreichs Ataxia Network. For more about the ride, us and Freidreichs Ataxia please visit us at www.compassexpeditions.com.